Posted on April 15, 2018 by Emily Allbon. 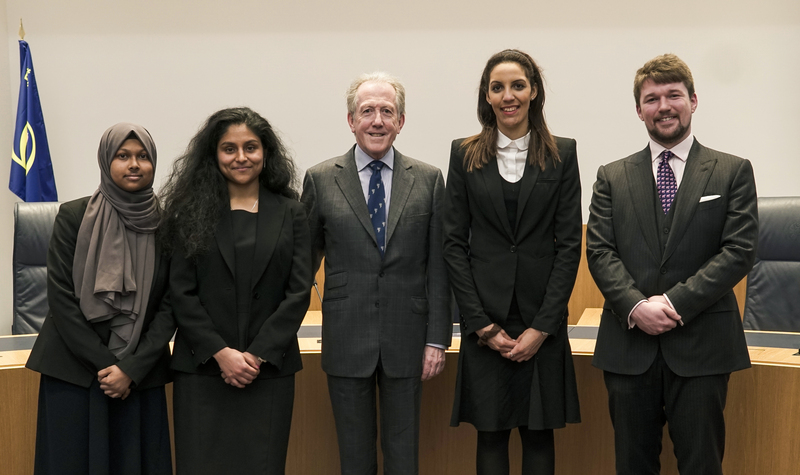 The UK Supreme Court was the place to be on March 27th: four City students were mooting in the final of the City Scholars Moot. They had battled through three previous rounds to make it to this occasion and were presided over by the recently retired His Honour Judge Cryan. 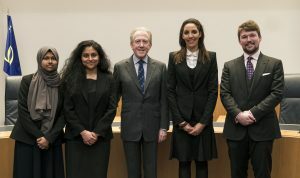 Amani Siddique (LLB1) and Cristina DeSouza (LLB1) acted for the appellants, with Joshua Lynbeck and Jade-Amanda Laporte (LLB in Legal Practice Year 2) acting for the respondents, and they dealt with two challenging points of appeal – relating to the contractual principles of consideration and promissory estoppel. Against a backdrop of economic crisis relevant to the retail sector, the Defendant appealed on the grounds that the Court of Appeal erred in their application of law – appealing that the Claimant was bound by an agreement to accept half payment due to a practical benefit having been received and that promissory estoppel could be relied upon. The winner on the night was Jade-Amanda, with Cristina as runner-up. They celebrated their success by accompanying Judge Cryan to a London Club for a meal afterwards. We look forward to seeing how their mooting progresses next year! Nanny your way through law school…non-law roles can be beneficial too!